Rediff.com » Movies » Readers' Pick: Top 10 Bollywood Actors of All Time! 'We showmen live in a world of our own, a world so weird and strange. We make people laugh or cry with us and thereby transport them to the magic world of fantasy and make-believe. In the process, we ourselves become part of that world, which brings added joy to our admirers, ' notes actor Balraj Sahni in his remarkable autobiography. There's a certain enchantment to this profession -- the aura it creates, the commitment it demands and the immortality it offers. Over the last century, the silver screen has witnessed numerous actors come and go, shine and fade. But it's the ones who make a lasting impression, the ones so deeply imbued in celluloid and public memory; neither time nor fate can diminish their glory. As a part of our 100 Years of Indian Cinema special, we asked you, dear readers and discerning audience, to name your favourite Hindi actors of all time. And quite an eclectic mix it's turned out to be. 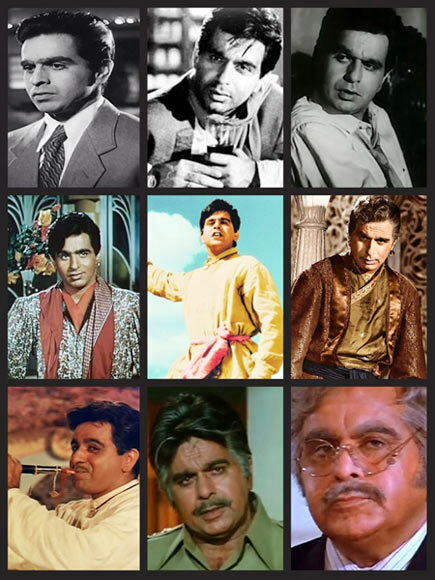 So here then, is YOUR pick of the Top 10 Hindi Film Actors of All Time. It's incredible the ease with which a genial smile and soulful eyes can transform into snarling rage and threatening glares. 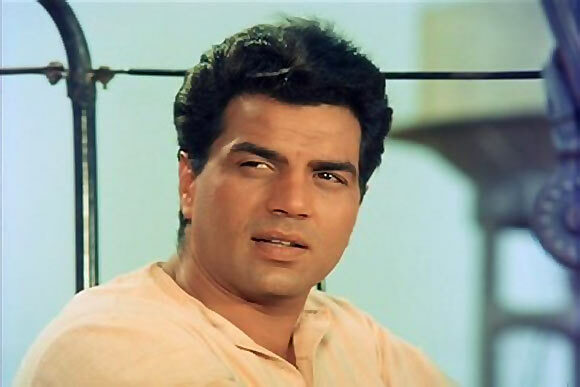 It's a Dharmendra specialty and one of the many, many reasons he enjoys such a beloved place in every viewer's hearts. The understated warmth in his tone as well as the untainted goodness of his handsome demeanor is captured in films like Anupama, Satyakam, Guddi while his side-splitting sense of humour comes alive in Chupke Chupke, Ghazab and Naukar Biwi Ka even as the He-Man made mincemeat out of baddies in Mera Gaon Mera Desh, Sholay and Dharam Veer. Even the latter phase of his prolific albeit underrated career is marked by a fascinating range of performances like Apne, Johnny Gaddar, Life... In A Metro and Yamla Pagla Deewana. From the proverbial outsider to a reigning superstar, Shah Rukh Khans enjoyed uninterrupted success for the greatest chunk of his career. And in this golden phase, he played the adorable loser (Kabhi Haan Kabhi Naa), the obsessive lover (Darr), a ruthless killer (Baazigar) and every single time his risk was rewarded with a super hit. Where most would get typecast, SRK turned the tide in his favour to become the poster-boy of epic romances through endearing characters like Raj in Dilwale Dulhania Le Jayenge, Rahul in Dil To Pagal Hai and Kuch Kuch Hota Hai who were tightly embraced by an audience both in India and overseas. 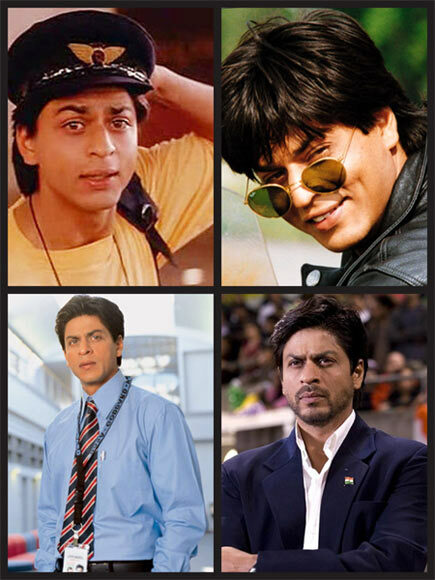 Although it's his grounded charisma and unaffected realism as a NASA engineer and Hockey coach in Swades and Chak De! India that truly reveals the degree of depth he's capable of. The sort of wild adulation and indescribable hysteria Rajesh Khanna triggered is stuff legends are made of. His delightful good looks, unprecedented magnetism, stylish mannerisms and a gift to make even commonplace seem crucial with a dedicated, larger-than-life delivery cannot be put in plain words. No wonder he's considered Hindi cinema's original superstar. 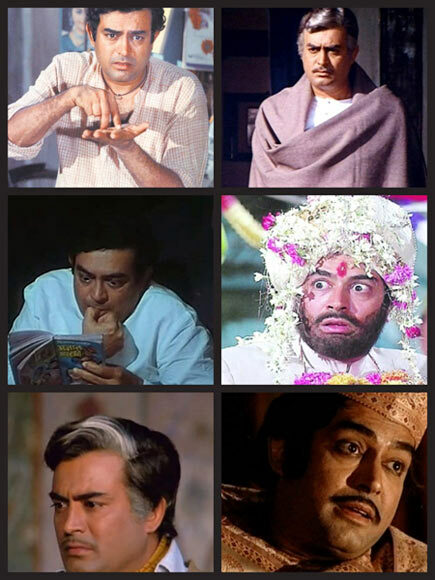 In a career spanning more than four decades, Khanna delivered steadily as the dynamic pilot father-son of Aradhana, an edgy fugitive in Itefaq, the dhoti-clad melancholic of Amar Prem, the multipurpose cook of Bawaarchi and, most memorably, in and as Anand where the audiences laughs over his lovable antics, cries at his cruel fate and lives though his spirited philosophy. Jeena yahan marna yahan, he says. He meant it too. Raj Kapoor lived by this dictum all through his celebrated existence. One of the earliest stars to flex as a filmmaker, the blue-eyed legend created a legacy of supreme talent and passion for cinema that would reflect in his descendants for years to come. His sublime, soft-spoken ardor and bumbling body language (modeled around Charlie Chaplin), aimed to reach out to the common man and create a greater stream of consciousness within the self-seeking society through films like Awaara, Shree 420, Jagte Raho and Jis Desh Mein Ganga Behti Hai. At the same, he exuded a rare, heartbreaking sensitivity that resulted in poignant performances in films like Sangam, Mera Naam Joker and Kal Aaj Aur Kal. 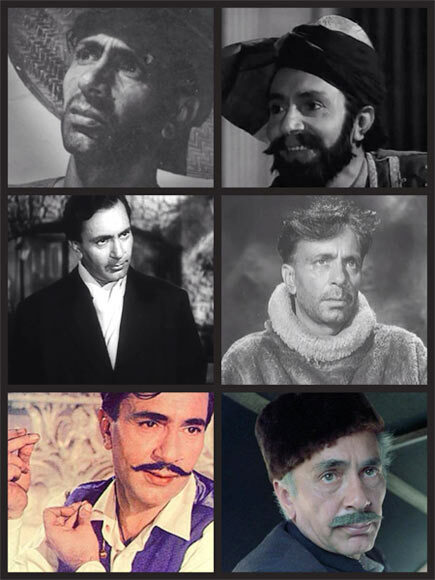 Balraj Sahni may not fit the traditional imagery of a hero but long before art-house cinema gained momentum, he demonstrated the strength in subtlety through a variety of films. A true perfectionist, Sahni was known to study his characters and embrace the environment they belong to before he began shooting. And so whether it's conveying the pathos of impoverished peasants in films like Dharti Ke Lal and Do Bigha Zameen, the grief of a father who longs to see his daughter in Kabuliwala, a determined army man in Haqeeqat, a prosperous man facing terrible times and estrangement from his family in Waqt or a Muslim businessman in post-partition India in Garam Hawa, there's hard-hitting credibility and timeless wisdom to every role he portrayed. To have a distinct style and yet not be defined by it is an impossible accomplishment but the late Sanjeev Kumar achieved this feat effortlessly. And that's why he could easily spew venom as the vengeful cousin in Sunghursh, orchestrate a brilliant comedy of errors in Angoor, reek of unapologetic arrogance in Trishul, seek non-negotiable revenge as the handicapped Thakur in Sholay, convey the regret and nostalgia of an estranged marriage in Aandhi or, heck, even turn all were-wolfish on us in Jaani Dushman without as much as batting an eyelid. Truth is there can be a bad Sanjeev Kumar film but there's nothing like a bad Sanjeev Kumar performance. 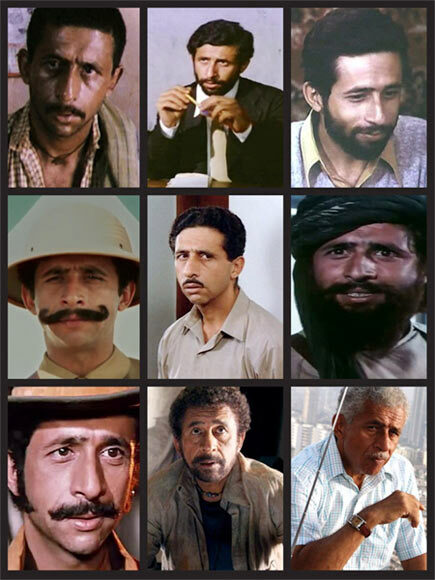 Designed for superlatives and awe, Naseeruddin Shah is Hindi cinema's most consummate artist. His mastery lies not in showing off but slipping under the constantly changing skin of his on-screen persona while delicately adjusting his vigorous, versatile individuality to suit the man in the script. Be it parallel cinema or mainstream masala, Shah has worked in every conceivable genre and mindset of filmmaking with great success. 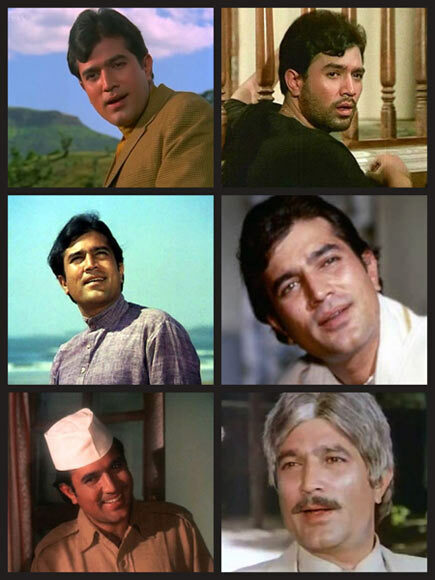 His blustering intensity in Junoon, dignified grace in Sparsh, despicable lust in Mirch Masala, quirky fella in Pestonjee to playing the cool cop in Jalwa, goofing around with a cowboy hat in kitsch that entirely works in Tridev or a common man unnerving the law and order system in A Wednesday, Naseer's body of work is much too massive to be spelled out in a few paragraphs. Perhaps it's his unfailing consistency at delivering quality films that has earned Aamir Khan such a high rank on this list. It's not an easy reputation -- if it's an Aamir starrer it must have something substantial to offer -- to live up to. But quite early in his career the Qayamat Se Qayamat Tak star understood the durability in picking excellence over abundance resulting in a 'one film a year' policy. Whether it is perfectionism or intelligence, his studious approach in tackling roles, maintaining high standards and prioritising the bigger picture has certainly paid off. 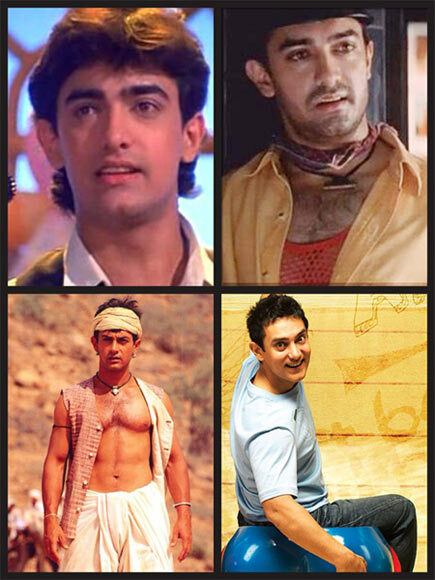 And this remarkable devotion is what makes his evolution in Jo Jeeta Wohi Sikander, Akele Hum Akele Tum, Andaz Apna Apna, Rangeela, 1947: Earth, Sarfarosh, Lagaan, 3 Idiots and Talaash so relishing. For someone who didn't even aspire to be an actor to be regarded as an institute in his own right is quite commendable, isn't it? Dilip Kumar changed the rules of the game. His entry happened at a time when acting was synonymous with theatrics. But this so-called novice rendered it a form of its own by laying emphasis on techniques like restrain, revision and texture. 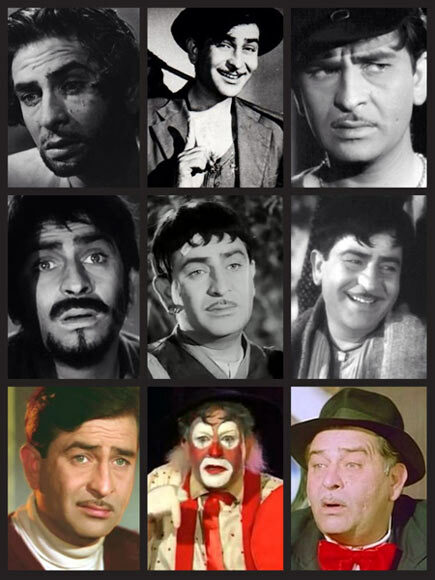 And so this living legend breathed life into many a tragedy bound heartbroken romantics like Devdas only to break from the shackles of an all-consuming image to play a swashbuckling rebel, goofy comedian, aggrieved anti-hero, face of socialism and later an angry senior citizen in his impressive career through memorable roles like Aan, Kohinoor, Azaad, Ram Aur Shyam, Naya Daur, Gunga Jumna, Mashaal, Karma and Saudagar. Had he not become an actor, Amitabh Bachchan, once famously joked, he would be selling milk in his native Allahabad. It's inconceivable, of course, to imagine one of India's most adored super icon to be anything but India's most adored super icon today. 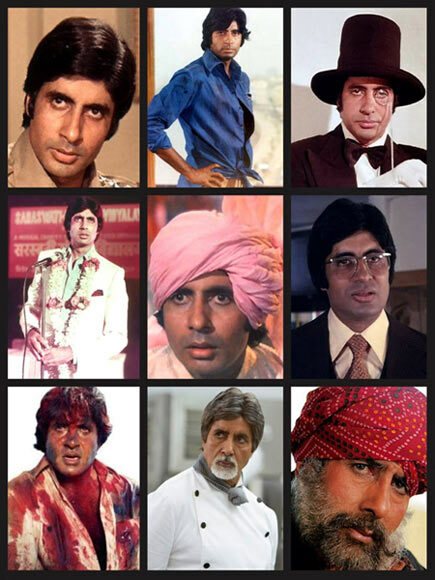 From a lanky nobody who starred in countless flops before getting noticed as the supporting character of Babu Moshai in Anand to playing countless avatars of Vijay in Zanjeer, Deewar, Trishul, Don and Agneepath, Big B kick started an era of incensed anger that fought and defeated all evil. His heroics and anguish, which he conveyed with such genuine emotion and towering authority, made him a hit with everyone in the audience -- young, old, man, woman. At the same, he showcased his terrific spectrum as a performer by tickling us to bits in Chupke Chupke, Namak Halal, Amar Akbar Anthony, Yaraana, Satte Pe Satta and Mr Natwarlal, conveying the intricacies of romance in Abhimaan, Kabhi Kabhie, Mili and Silsila. But it's not mere star power or exceptional fortune that saw him sustain innumerable setbacks in personal and professional life. The survivor in AB battled controversies and nagging health issues to rise to the occasion every single time to kick start the most exciting phase of his career -- Eklavya, Cheeni Kum, Paa, The Last Lear and Sarkar. At 70, the superstar is all set to make his Hollywood debut in a Baz Luhrrman's The Great Gatsby. It may be a small role but good enough to get its own poster. Give it up for Bachchan!